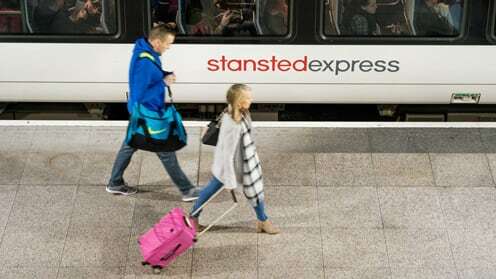 Stansted Express offers the fastest way to travel between London Stansted Airport and London. Trains depart every 15 minutes and take just 47 minutes to and from London Liverpool Street. If you have an early flight departing at London Stansted Airport, the train services start at 03:40am - from London Liverpool Street to the airport - on Monday, Friday and Saturday mornings. Rail services connect London Stansted Airport to all major destinations across the UK. Getting the train to the airport is easy, because The Station is located directly under the airport. With lifts, escalators and ramps to transport your luggage, it takes just two minutes to walk to and from the terminal. You can buy tickets online, or at the ticket machines or rail information desk located at The Station. Save money by pre-booking your train ticket rather than buying on the day of departure. Those who require accessibility services will be able to find a full range at our train station. Most train operators have their own policy on taking bicycles on board. Stansted Express: Only fully-folded bicycles which have been flat-packed may be taken on board. Greater Anglia (other services): Bikes can be carried on most trains but there are restrictions on some peak-time services. CrossCountry Trains: Bikes can be carried only when booked in advance. You should contact the train operator for more information. It takes no more than two minutes to walk to and from the terminal, with lifts, escalators and ramps connecting the two. Overhead signs will help guide you through the airport. We advise that you factor in extra time during your journey to allow for delays and other unforeseen circumstances. Some train operators allow you to use an alternative service should you miss your train. However, we advise that you contact the train operator you’re travelling with to check their policy. I require special assistance. What facilities are there at the train station? London Stansted Airport rail station is staffed every day except Christmas Day. Induction loops are fitted, and the whole station has step-free access. If you need any information or assistance at The Station, please email assistedtravel@greateranglia.co.uk at least 24 hours before you travel. How do I get to the London Underground? Stansted Express services run to London Liverpool Street, Tottenham Hale and Stratford. To get to the London Underground you’ll need to make a change, depending on which line you’ll be travelling on. Central, Circle, Metropolitan, Hammersmith and City Line: Change at London Liverpool Street. For more information – as well as some helpful video guides – visit our Stansted Express Travel Information page. Stansted Airport customers who travel from London Liverpool Street or Stratford should note that their Oyster card is only valid to Tottenham Hale. Failure to buy a ticket from Tottenham Hale to Stansted Airport, and return, may result in a Penalty Charge Notice from Greater Anglia.